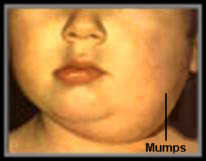 MMR is a single vaccine that offers protection against mumps, measles and rubella (German measles). This combined vaccine was introduced in 1988 and has seen a massive fall in the development of these diseases. All these diseases are highly infectious and can be spread over a wide area just from a sneeze or a cough. They can all have serious complications such as meningitis or encephalitis (swelling of the brain) and deafness, therefore it is important that your child is protected. Babies are protected from the diseases from the natural immunity given by its mother. This fades at around their first birthday. Therefore the first infection is given around this time. It is injected into the muscle of the thigh or upper arm. 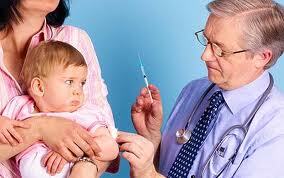 The second injection is given aged 3-5 years. Because the vaccine contains weakened versions of the live viruses there may be some side effects which could include a loss of appetite and a measles like rash. They may become feverish up to 10 days after the infection. It is important to reduce their temperature to reduce the risk of your child having a febrile convulsion or fit. You can reduce their temperature by giving them liquid paracetamol or ibuprofen, reducing the layers of clothes and blankets and giving them plenty of cool drinks. They may also develop a mild form of mumps or measles that can last 2-3 days, and also extremely rarely, they may develop a rash of small bruise like spots in the 6 weeks after the immunisation. If this occurs, you should consult your GP. These symptoms may occur at different times due to the immunisation being 3 separate vaccines in one. But remember that these side effects are usually only mild compared to the complications of mumps, measles and rubella. Many people believe MMR is linked with Autism. This is due to a study published by a doctor in 1998. He claimed that his findings appeared to show a link between the vaccine and MMR and bowel cancer. This work has been completely discredited and experts from around the world including the World Health Organisation (WHO) agree that there is NO link between the MMR vaccine and autism. Unfortunately symptoms of regressive autism often start at around the same time that the first dose of the vaccine is given – leading parents to believe that there is a link. If the MMR vaccine and autism were linked, regressive autism would be far more common in children that have been vaccinated but this is not true. Many parents ask why can’t their child have the vaccines given singly. Unfortunately this is not on offer in Britain as WHO believes this would leave children at risk for no benefit. This is because it would involve having six injections and many people would not finish the course therefore leaving some children unprotected. If you are thinking of becoming pregnant, you should check with your GP to see if you are immune, as contracting rubella in pregnancy may have devastating effects. For more information please see my previous blog on Pregnancy and Rubella. I would like to become a midwife someday. What should I learn and in which order should I learn them? You do not say what your qualifications are, or how old you are, but to become a midwife you have to complete a 3 year degree course. You have to attend university and also work in the labour ward or post natal ward of your chosen hospital. To help your chances of becoming selected on the course, you should try to do some voluntary work at your local hospital and also do some studying in subjects that would be useful such as biology or sociology or psychology.